Should I Clean and Seal my Fence? Fences may not be an outdoor surface that you “use” like your deck, patio, driveway or walkway, but they still serve a purpose. They define your outdoor living space and property and keep your kids and pets in the yard (or your neighbors out). They, like all your outdoor surface, need regular maintenance to stay looking great. Wood fences withstand a lot of elements being outside. It’s normal for mold, mildew and dirt to build up over time. All of that, plus the wood drying out from the sun’s harmful rays, can weaken the wood. 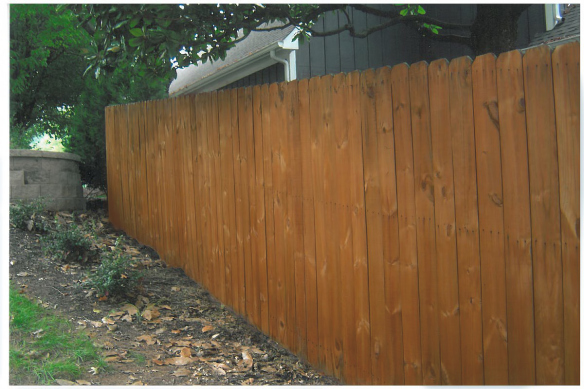 Regular fence cleaning and sealing will make your fence last longer. It will keep the wood from drying out and breaking. Fences are part of your outdoor landscape. Unless they are completely covered by bushes and trees, you will lookout into your backyard and to your fence. Don’t you want it to look nice? Take this deck for example. While the yard is nice and green, the fence is grey dreary. After a nice and thorough fence cleaning, it looks brand new and much more pleasant to look at while spending time outdoors with friends and family. At Renew Crew, we recommend not only cleaning the fencing that faces your outdoor living spaces, but also the fence that faces the street and passersby. A clean and sealed fence will increase the curb appeal of your home, making it look like a property that is well cared for. Fence cleaning requires a great outdoor cleaning product and pressure washing. At Renew Crew, we use environmentally friendly foam to clean wood. Pressure washing is important to removing the built-up dirt and splintering wood, but when done incorrectly, it can also leave marks and gouges in the wood. Hiring a professional to do the work ensures your fence is left undamaged. Sealing the fence will bring back the color to the wood as well as protect it against the elements. 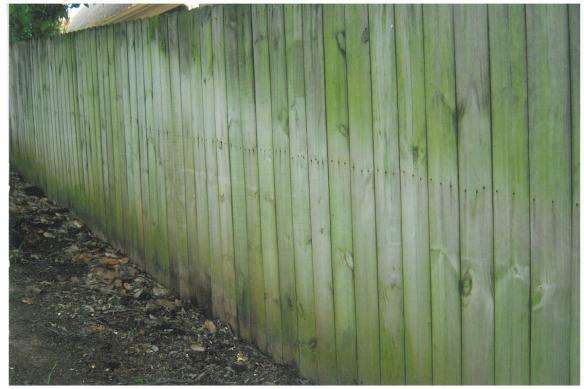 If you have questions on fence cleaning and sealing, please contact your local Renew Crew office. Outdoor living structures have to withstand a lot being outside in the elements all year round. It isn’t surprising that sometimes they have to be updated or parts have to be replaced. I was recently walking my dog around the neighborhood when I noticed a fence that had had some work done. The majority of the fence was a greying wood. It was probably installed several years ago. In the middle of the space, however, was a section of brand new wood boards. They were clean as can be and had obviously been replaced a short time ago. The replaced section made the rest of the fence look even worse than it was. New wood boards stand out when installed next to boards that have been out in the elements for years, just take a look at this deck to the left. There is a way, however, to update the old boards so they are close in color and look to the new. First, the old wood has to be thoroughly cleaned. A wood deck cleaner will loosen the dirt and grime that has built up on the wood over time. 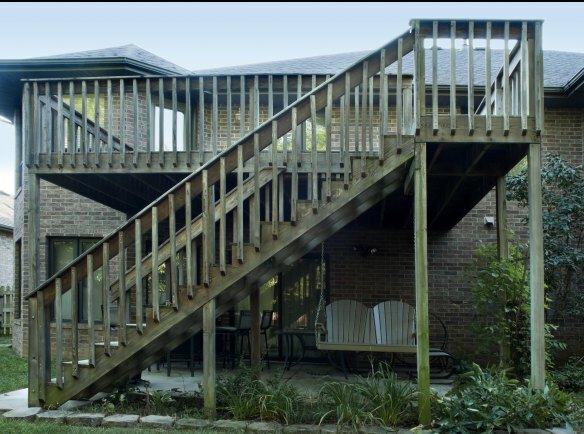 Additionally, and more importantly in the case evening out the appearance of the structure, a good deck cleaning product will loosen the dried out, greying wood fibers. Once the cleaner has worked its magic, the surface can be pressure washed. The pressure of the water will rinse away the dirt and dead wood fibers. During this step, you’ll notice the difference in the wood’s appearance. It will begin to look similar in color to the new wood boards. It helps if the new wood is also cleaned too. The last step is to apply a protectant to both the old wood and the new wood. At Renew Crew, our semi-transparent wood protectants and sealants allow the wood grain to show, but does add some color to the space. This picture shows the same deck as above and you can’t tell which board is new and which is old! If you need to have the color of your deck or fence evened out, please contact your local Renew Crew. The first question to ponder is whether you prefer a semitransparent or solid wood stain. Solid wood stains have a similar finish to paint, masking the wood grain. They normally show wear more quickly than semitransparent, but it does provide a nice even color throughout the space. Semitransparent wood stains protect against moisture and dirt, but don’t cover up the wood grain like a solid stain. After you’ve decided on a semi-transparent or solid wood protectant, the color is important. You’ll want something that complements and doesn’t clash with the finishes of the house. Consider what will go well with the façade or trim of the home. The homeowners on the left opted for the natural wood protectant as they wanted to see and appreciate the grain, knots, etc. of the wood. The home on the right, needed the darker brown color to go with the darker trim colors of the home. You can see in the picture that around the garage door they have a darker wooden frame. This fence was finished with the cedar finish. While the base of the cedar is red in texture, it can look different on different wood as it brings out the natural reddish tones in the wood. If you have questions on pressure washing and protecting wood, please reach out to your nearest Renew Crew location. Our trained professionals will work with you to get your outdoor living spaces looking great and will help you to pick the right finish for your property. A few weeks ago I posted about the different wood cleaning products that are available on the market. Some are super strong, but can be harmful while others aren’t strong enough for all of your cleaning needs. Renew Crew’s foam cleaner is the best way to get your outdoor surfaces, not just wood, looking brand new. Several years ago (pre-Renew Crew) my brother “cleaned” the siding on his house. I say “cleaned” because I’m not exactly sure what it did (it didn’t look any cleaner to me). He sprayed some liquid cleaner on the siding which to me looked like it just ran down the side of the house without doing any cleaning. This is one of the reasons Renew Crew uses foam cleaner. Renew Crew’s proprietary cleaning solutions come in foam form instead of liquid. We find that using foam allows it work deeper into the surface than liquid. Take this dirty deck for instance. It has greyed in areas and has mold and mildew built up on it. There a lot of cleaning to be done. Whatever cleaning solution is used, it has to dig deep into the surface, loosening embedding dirt and dead wood fibers and killing the mold and mildew. Here is a picture of the fence mid-project. It has been foamed with our wood cleaner. You can see that the foam is sticking to the horizontal surface allowing it work its magic. Yes, it will drip down (it doesn’t defy gravity), but it takes longer to do so, giving it time to do its job. Liquid cleaners don’t do this. They drip down on horizontal surfaces or sometimes puddle on vertical ones. That’s why you may see projects that don’t look even in cleanliness or color. With any outdoor cleaning product, even environmentally friendly ones likes ours, the surface does need to be rinsed. In most cases, a pressure washer is used because it provides the strength to get rid of everything that is rooted in the surface. We at Renew Crew suggest having a professional pressure washing company do this, especially if you aren’t familiar with using a power washer. It can not only damage your outdoor surfaces, but it can also be dangerous for the person using it if not handled correctly. Here is the same fence after it has been cleaned and protected. Doesn’t it look great? The rich wood color is back without the dirty mold and mildew. If you have any questions regarding cleaning outdoor surfaces, please reach out to your local Renew Crew office. When my husband and I were looking to purchase our first home, I was excited to visit different properties to see if I could envision us there. The outside of the home became an important piece of the puzzle as we went from house to house. While some homes were beautiful on the outside, there were others that I knew I didn’t like as soon as we pulled our car up to the front. When looking to sell a house, there are a few exterior cleaning projects that will make your home look great. Last week we talked about cleaning vinyl siding. If the front of your home is siding, make sure that it is properly cleaned, removing the dirt and exposing the color below. Particular attention should be paid to the areas right below the roof line where some stains will accumulate. Driveways and walkways in front of the home can make a huge impact. Take this house for example. If I had cropped the picture to not include the driveway, it looks great, a beautiful brick home. The driveway makes it look much dingier than it really is. Driveways, not surprisingly, get very dirty. Between dirt from the car tires, oil leaks and daily traffic, keeping a driveway perfectly clean is nearly impossible. Most of those stains, however, are removable. Take a look at this after photo. The home looks brighter and cleaner for people who visit the property. I was surprised to find how much attention I gave the front stairs of the homes that my husband and I looked at. Why? Our realtor came to all of the houses with us and would have to get into the lock box and unlock the front door. During that short few minutes, we would be standing on the front stairs waiting. Cleaning the front stairs will make your home look better than if there is caked on dirt on all of it. Wouldn’t you rather picture yourself sitting on these after picture stairs than the first? I know I would. Lastly, take note of any fences you have towards the front of your property, especially those that have gates that potential buyers have to walk through. Ridding it of all the embedded dirt and mold and having a new protective seal will make it look so much more welcoming. At Renew Crew, we pride ourselves on making a huge visual difference on the property through the deep cleaning and protecting of all your outdoor surfaces. When preparing your house for sale, make sure not to only focus your efforts on the inside of the home. The outside is just as important, if not more. It is the first impression that people get of hopefully, their future home. We at Renew Crew often get questions regarding our deck sealant and what makes it better than the rest that are on the market. The answer: it’s much more than just a sealant, it’s a protectant. Our protective deck sealant does have a staining factor, but it also protects the wood from further damage. What a lot of homeowners may not understand is that the sun’s rays are harmful to wood decks. They dry them out and turn the wood grey. Our wood protectant stops the sun’s rays and reflects them away from the wood. While we have 9 color choices for our Renew Crew deck sealant and protectant, the majority of our jobs use two colors that we refer to as cedar and natural. Why with nine colors do we primarily use two? It’s because of the versatility of these two protectants. And just because it’s two colors doesn’t mean it has only two finishes. Let’s take a look at these jobs from Eric McVey, who provides deck cleaning in Northwest Arkansas. Both of these two projects were finished with our cedar protectant, but the color doesn’t look exactly the same, does it? The deck has a more subtle look while the fence is a deep reddish brown, that’s because the cedar color isn’t necessarily a specific color, instead it enhances the natural characteristics of the wood itself. 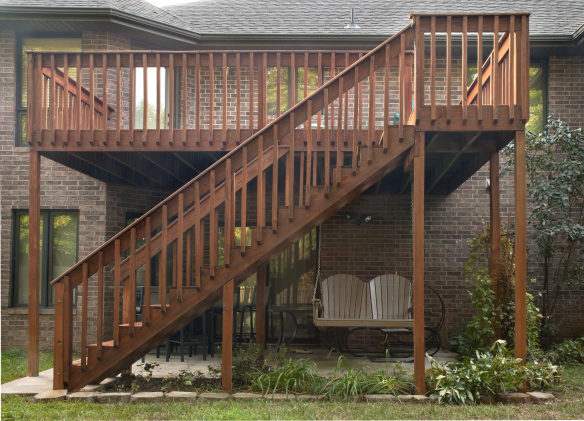 If it’s applied to a redwood deck, it will bring out the natural red colors in the wood, while it will bring out the deep brown colors on a darker wood. Here’s an example of the natural protectant. The decking was done with the natural product while the pergola was finished with cedar, which is a little darker. In both cases you can admire the natural grain of the wood. Water beads up on its surface as opposed to soaking into the wood just like some other stains, except it has a much more natural look. The vast majority of our clients prefer this over a blanketed color. For those clients that do like something that is more uniform, we do have a variety of protectants that are always a standard color, but it does cover the wood grain. Take a look at this deck sealant from Renew Crew of Northwest Arkansas for an example. The color is consistent throughout, which is just what the client wanted and it looks great! It’s just a different finish which totally depends on your tastes. If you have questions on any deck cleaning or sealing products, reach out to your local Renew Crew office. They will surely be able to help you with your outdoor cleaning needs. Carpenter Bees in Your Wood Siding? Carpenter bees are found throughout much of the southern and eastern United States. They resemble bumblebees except they have smooth and shiny bodies instead of hairy bodies. They also lack the pollen baskets on their legs that bumble bees have. They are not usually serious pests, although their tunnels can be damaging if the bees infest the wood annually to nest. When carpenter bees nest they do so in wood and create tunnels in and out. The original entry hole is perfectly round and approximately a half inch in diameter. The tunnel turns at a right angle after penetrating the length of the bee’s body and runs across the grain of the wood. Carpenter bees don’t usually create any structural damage despite their tunneling in wood, but that doesn’t make them any less annoying. Males are known to be aggressive when they are in their spring mating season, which may ruin your outdoor relaxation, but, don’t worry, the males can’t sting. I for one don’t enjoy the thought of bees tunneling into my wood siding, deck, porch, fence, et cetera, but what can we do to prevent or treat them? Carpenter bees don’t tunnel into just any wooden surface. In general, they go after untreated, unfinished wood. Making sure that your wooden outdoor structures are finished and sealed is a great way to keep carpenter bees at bay. At Renew Crew, every time we clean and pressure wash a deck or any other wooden surface, we follow it up by protecting it. Our protective finish not only deters carpenter bees from tunneling, but also stops dirt and grime from settling in the surface. If carpenter bees are already tunneling in your decks or fences, you’ll need an insecticide to get rid of them. The best method for bees is to use a dust type insecticide that can be shot into the tunnel holes. You’ll want to apply the dust in the spring months before the adults become active. If you wait, make sure to use the dust at night, reducing your risk of agitating the female bees. Angry female bees are known to sting to protect their nests. So what do you do if you have tunnels in your wood that you would like to cover up? The first thing to do is to block and seal the nest holes so that future bees don’t find them (carpenter bees will use empty nests before creating new ones). Wood putty will work well to fill any holes. Once the deck is treated, the holes should be less noticeable. For instance, at Renew Crew, our protective finish will camouflage any preexisting holes and deter bees for the future! If you have questions about maintaining wood structures, please contact your local Renew Crew office. Hurricane Sandy devastated parts of the Northeast this weekend and impacted a large part of the country. As we begin recovering from the damage, everyone here at Renew Crew is thinking of those affected by the storm. Cleaning up after Sandy will take weeks for some areas and months for others. As some of your exterior surfaces may not look their best after the high winds and rain, Renew Crew wanted to offer some clean up tips. *Brush off your decks, porches, patios, walkways, etc. to start the exterior cleaning process. Not only will get the leaves and branches off the surfaces, but an outdoor brush may be able to remove a large amount of the dirt that was swept onto it. When it’s swept off, you’ll be able to see if you need professional help. If you don’t know how to use a pressure washer, don’t try. Call a professional. A power washer, when not used properly, can not only harm your outdoor surfaces, but you. Power washers are strong machines. When used correctly, they can have great results, but when done incorrectly, it can gouge your wood decks leaving clear lines where the power hit it. 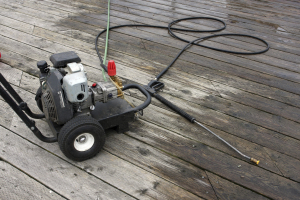 More important than your deck, however, is you, and pressure washers can cause serious injury. They can cut through the skin VERY easily and can push water (or chemicals if you are cleaning with them) under your skin. Unfortunately after some big storms, some people try to take advantage of those people whose mindshare may be heavily divided. Make sure you are working with a reputable, licensed and insured company and not someone who popped up out of nowhere. That way, you you’re your outdoor spaces will be treated and cleaned the way they should be. If you have questions regarding exterior cleaning, please contact your local Renew Crew office. When my husband and I bought our house, it already had a small deck on the back off the kitchen. Unfortunately after updating other parts of the house, we didn’t want to spend another $10,000 on a new deck when the one we already had one that was structurally sound. That’s when we realized that we just needed to get it cleaned and refinished. That’s the idea behind Renew Crew, to get more time out of your outdoor living spaces before replacing them. Every deck, patio or walkway is going to show some wear as time goes on, especially in areas of the country that have harsh winter elements. Wood will fade and stains will happen. Renew Crew’s deck cleaning and sealing process will rejuvenate your outdoor spaces making them look new again. Our Pre-Soak foam penetrates deep into the outdoor surface loosening and lifting embedding dirt. For especially difficult stains a specialized product may be applied to make sure we get the majority of the spot out. After rinsing your deck, porch, patio or other outdoor living space with non-damaging pressure, Renew Crew seals the structure with a product that protects the space from dirt, grime and the natural elements. Our deck sealing product has special polymers that block those and UV rays that often fade your deck to grey.